Andrew Suniula will live the dream this weekend, when the Auckland-raised United States Eagles centre plays alongside his young brother against New Zealand at Soldier Field in Chicago. 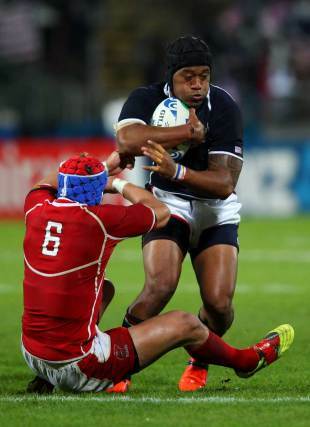 Half-back Shalom Suniula, 26, will play his sixth Test for the Eagles while Andrew will earn his 31st cap since 2008. Their only regret is that a third of six brothers, Roland, won't play his 18th Test after failing to gain a release from French club Chalon. "Having Roland here would have made it perfect," Andrew Suniula said. "Shalom playing means a lot. Rugby has taken me around the globe and given me some big games like this week, but what has been most rewarding is doing it alongside my brothers." The siblings were born in American Samoa, making them eligible for the Eagles, and they attended Kelston Boys' High School in Auckland after shifting to the Auckland suburb of Te Atatu at a young age. Their paths differed markedly after school, with Andrew the most nomadic. He failed to earn a Super Rugby contract in three seasons in Taranaki, prompting a brief foray into rugby league in which code he played four times for Manly Sea Eagles in Australia's NRL premiership. He then commenced his connection with the US when offered a contract by Chicago Griffins, leading to stints at English clubs. "I love this city, but it doesn't really know rugby. To sell out Soldier Field and play the No.1 team in the world, you'd have to say all the stars have aligned for me. And it's a pivotal moment for the game in the US. I think we're jumping two or three steps." Andrew Suniula is likely to play inside centre while Shalom is being considered for an unfamiliar role at half-back after starting three home Tests in June at first five-eighth. A contracted player in the US sevens squad, Shalom plans to focus fully on qualifying for the side to play at the Olympics after this year.